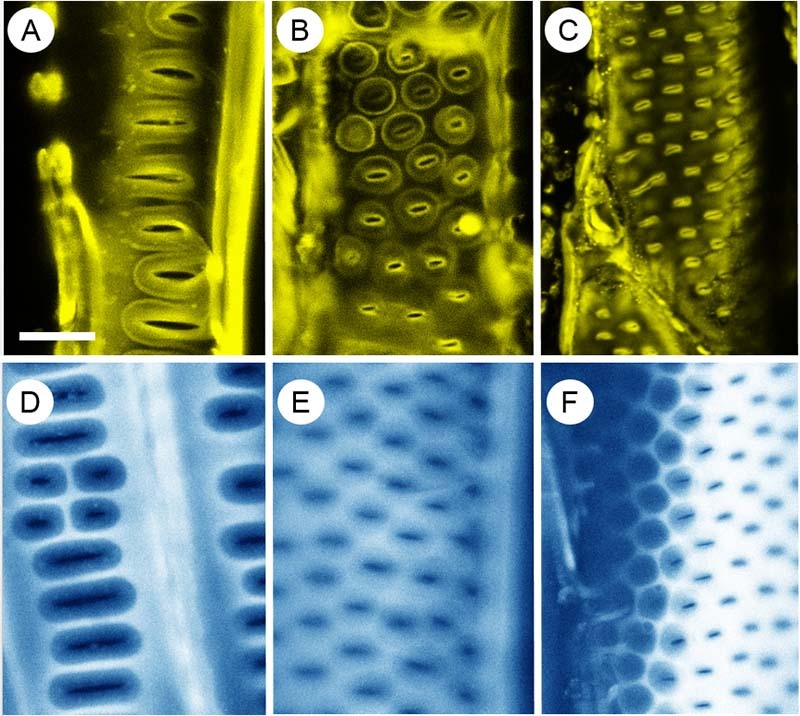 Evidence for amphiphilic molecules in lyophilized xylem sap residue of Distictis buccinatoria. A: With FM® 4-64, amphiphilic lipids in red. B: With NanoOrange®, proteins in yellow. Scale bar = 100 μm. Lumen-facing vessel wall surfaces imaged under confocal microscopy with (A-C) FM®1-43 fluorescent dye to mark hydrophobic surfaces and (D - F) lignin autofluorescence under excitation at 405 nm. A & D Liriodendron tulipifera, B & E Triadica sebifera, C & F Geijera parviflora. Scale bar = 10 µm for all images. Research Area 1: How do plants transport under negative pressure? Vascular plants transport water in their hydraulic system, the xylem, under subatmospheric or negative pressure. An axiom of xylem biology states that it is the high surface tension of water that protects xylem conduits against bubble entry through the nanopores of pit membranes that connect conduits to each other. This axiom was recently challenged by our finding that xylem sap contains significant amounts of surface-active phospholipids and proteins (see images on this page), that lipid surfactants isolated from xylem sap had strongly area-dependent surface tension that reached values more than ten times lower than that of water, and that xylem sap contains surfactant-coated nanobubbles (see video on this page). We hypothesize that lipid surfactants function to reduce bubble sizes by lowering surface tension at gas-water interfaces, and that the resulting nanobubbles remain below the critical threshold radius for pure gas bubbles in water, which would allow them to dissolve instead of expanding and forming embolisms. This would mean that xylem lipid surfactants may be an essential tool that makes water transport under negative pressure possible. The research addresses the following questions: (1.) What is the chemical composition of xylem surfactants,? (2.) Where in the xylem are surfactants located and where do they originate? (3.) What are the physical characteristics of xylem surfactants? (4.) Are xylem surfactants ubiquitous in vascular plants? Researchers: Susana Espino (until 2017) and undergraduate students David Romo (graduated 2015), Neda Nima, Aissa Do, and Joseph Michaud. Jansen S. & Schenk H.J. (2015) On the ascent of sap in the presence of bubbles. American Journal of Botany, 102, 1561-1563. Schenk H.J., Steppe K. & Jansen S. (2015) Nanobubbles: a new paradigm for air-seeding in xylem. Trends in Plant Science, 20, 199-205. Hydraulic systems that operate under negative pressure are very susceptible to heterogeneous nucleation of bubbles on hydrophobic surfaces. We use a variety of fluorescent probes and confocal laser scanning microscopy to characterize surface properties of xylem conduits. Hydraulic systems that operate under negative pressure are very susceptible to bubble formation, potentially leading to embolism formation and hydraulic failure. Gas saturation or super-saturation of xylem sap could potentially increase the chance of bubble formation. Our research is designed to measure dissolved gas concentrations in xylem sap using membrane inlet mass spectrometry and relate these data to patterns of embolism formation in woody plant species. Schenk H.J., Espino S., Visser A. & Esser B.K. (2016) Dissolved atmospheric gas in xylem sap measured with membrane inlet mass spectrometry. Plant, Cell & Environment, 39, 944-950. Xylem embolisms form naturally in wood, but does this happen regularly followed by embolism repair or is it a rare occurrence and more or less permanent? Past research designed to answer this question has relied on destructive measurements of hydraulic conductance, but these results are now seen as problematic, because cutting plant stems can introduce embolisms even when the stems are cut under water. We are testing new methods to avoid such cutting artifacts, including new cutting protocols and non-destructive measurements of ultrasonic acoustic emissions (UAE) and air flow into xylem, both associated with embolism formation and possibly repair. Schenk H.J., Espino S., Mendez A.N. & McElrone A.J. (2013) Limitations in the hydraulic pathway: Effects of xylem embolisms on sap velocity and flow. Acta Horticulturae, 991, 323-332. California agriculture and horticulture is challenged by severe and long-term drought that has cut water supplies for irrigation severely. Our research is designed to develop plant-based measures for making irrigation decisions based on true water need in fruit trees and avoid overwatering. Plant-based measures tested in our research include sap flow, stem water potentials, stem diameter variations, and wood water contents in addition to climate- and soil-based measures. Schenk H.J. (2014) Formation and repair of xylem embolisms: Current state of knowledge and implications for irrigation of horticultural crops. Acta Horticulturae, 1038, 311-325. Sensors for continuous measurements of plant water status and stress are often challenging to use under difficult field conditions. Our current research focusses on the use of stem psychrometers for measuring sapwood water potentials in deeply-rooted chaparral shrubs. Other continuous measures tested for these shrubs include sap flow and air flow into xylem that may be associated with xylem embolism formation and embolism repair. Other recent research on chaparral shrubs has addressed their osmoregulation in the xylem.